I think this photo was taken on 24.9.1948. On the back row from left to right is - Mr Bunyard, Mr Sample, Mr Escott, Mr Hall, Mr Bell & Mrs H McQuibban. On the front row from left to right: Miss Tooley, Miss Brawn, Mrs French Mr Boddington, Miss Palmer, Mrs Hatchard & (I think) Mrs Shipman. I also have the class photos (except Miss Brawn's class ) and would love to hear from anyone in any of the classes. I have the names of several of the children. I was in the same class as Sid Barker. Others I remember were Dave Ringer, Ian Perkins, Dave Hoskins, Sheila Crouch, Roy ?, John ? Gale, ? Longthorne, .... As I remember it the small amphitheatre was built for a Coronation pageant for summer 1953. I also remember a group of us congregating in the playground at 09:00 when Derek Bentley was hanged in January 1953. I left Love Lane school just before Easter 1955 to attend The Royal Hospital School. I started at Love Lane Infants in September 1948. I think the teachers in the picture were all the Junior School teachers. I was firstly in Mrs Coles class. I think her son Jeremy was also in my class and believe they came from Wickford where I seem to recall her husband was also a teacher or a headmaster. In this class we sat on little chairs, 4 to a little table. School dinners were 9d a day. The headmistress of the Infants was Miss Balls who I think married a Mr Osborne who may have been a County Councillor. I cannot remember which class I went up to next. Other teachers I recall were Miss Day who lived in a bungalow opposite the Catholic Church on London Hill, Mrs Gentry, Mrs Chapman who I believe came from Ashingdon, Mr Waller, Mr Muddiman, both of whom were very popular and well liked and possibly there was a Mrs Muddiman as well. 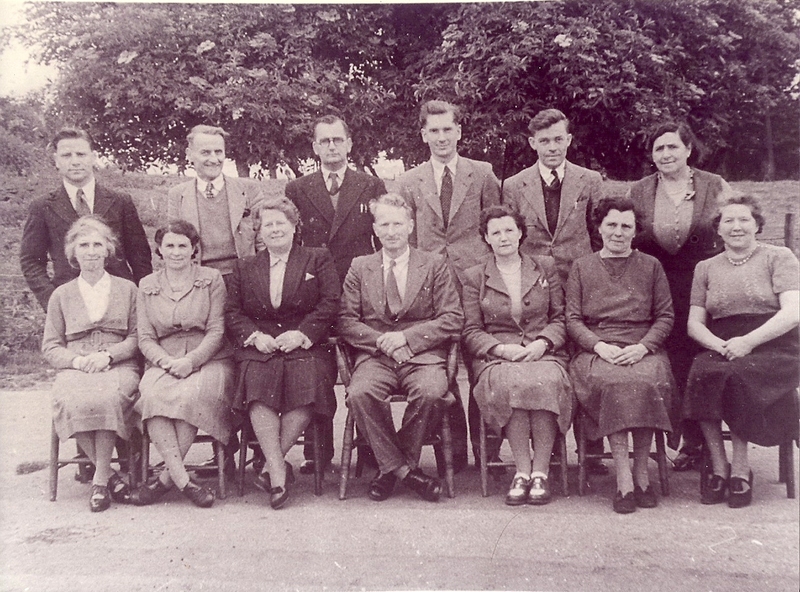 There was also a school secretary who I believe was a Mrs Long from Hullbridge, Regarding the teachers in the picture, I remember only Mr Escott who we nicknamed "Daddy". He rode a silver LE Velocette motorbike, like the police "Noddy Bikes". Mr Hall I think lived in Downall Road, Mr Bell lived in one of the little cottages on the High Road. We used to go to his lessons in the Co. Op. Hall across the road. I seem to recall he could lose his temper and shout at you and would whack yor backside with a large black plimsoll. Mrs McQuibban I can only remember riding on her little ex WD fold up paratroopers motor scooter through Rayleigh. Miss Brawn would punish you by hitting you accross the hand with the edge of a wooden ruler six times. Mrs French took the top class at Junior school. Mr Boddington the headmaster we called "Cecil" which I believe was his christian name. His wife also assisted him. She always wore little ankle socks. I remember Mrs Palmer but that is all. There was a teacher in the wooden building in the playground. This may have been Mrs Shiptons domain. All I can remember about this was that there was a room at the back where percussion instruments were stored and we had music lessons there. I was always unlucky and got either the triangle or the castanets, never the drums! A contemporary also says there was a room full of gas masks left over from WW2. The dining hall was downstairs under the infant school. The cook was Mrs Terry who lived in the last big white painted house at the top of London Hill opposite the old cottages. We were sometmes shown films by a visiting film unit in the dining room and I think they were mainly British Transport and Ministry of Information films. The daily milk supplies came from Howards Dairies at the back of the school through a back alley. It came on a pull along electric milk float and I remember once it overturned in the playground smashing all the bottles of milk. While I was there (I left in 1955), concrete slabs were laid on the grass adjacent to the rear playground for cricket net practise and an ampitheatre was constucted at the bottom of the field where school pagents were held in the summer. There was also a gardening shed full of tools and boots and some pupils were taught gardening. The caretaker was a Mr Robertson or Robinson who only had one arm. He used to stoke the boilers. At Christmas he used to cut a large branch off one of the fir trees at the front of the Junior School and this was put in the hall and decorated as a Christmas Tree. We probably had a Christmas party in the Hall. I can also remember a teacher whose name was Mr Hunnings? He used to come on a bike with a cyclemotor front wheel and used to padlock it religiously every day with a combination padlock. We manged to crack the code and used to take great delight in undoing it, moving it and relocking it. I often wonder if he ever realised? 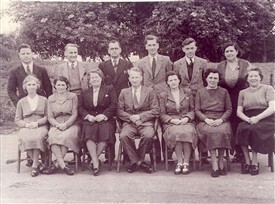 I was at Love Lane school from 1945 till 1952 and remember all of the teachers in the photo. The ones who were my class teachers were Mrs McQuibban, Miss Brawn and Mr Bell. I can't remember being taught by any of the others. Mr Bodington was the head master and we were in awe of him. I remember trying to carve my name on a tree at the end of the wooden building "the hut?". He had me in front of the whole school for a dressing down. Things went down hill from then on. Mr Sample "Taffy" was a formidable man, a veteran of WW1, he had a shrapnel wound and it gave him a lot of pain. I remember once in assembly he had an attack and was doubled up with pain. Perhaps this made him a bit grumpy. Mrs McQuibban was my first teacher. I can't remember much about the first years. I do recall her being rather a large woman, she rode to school on a Corgi scooter, when she sat on it her ample proportions enveloped nearly all of the scooter, a sight to behold for 8 year old school children, but we dared not laugh at her. Miss Brawn was so nice. It was, I think, the gentlest time I remember at school. Mr Bell was a good teacher he had time for every one. I learnt more from him than any other teacher. If they had all been as good as him I might have learnt more.